These are the four attributes which must be combined by the company you are considering for your next library relocation project. Focus must be brought to bear from the minute that our team first visits your location, so as to properly account for the scope & nature of your inventory; so as to properly assess the conditions in library alleys, doorways, and along the entirety of the path of movement; and to understand your potential need for access to the library while it is in transit. Planning must be detailed and properly convey to the library move team what it is that they have at hand. An experienced library moving company will know how many man hours, truck-trips, and library book move cart-trips will be made in the execution of the move. Precision of work on a minute by minute basis during the course of the library move will determine success – or failure. Our library move technicians have the proper equipment to ensure that library contents are loaded, transported and unloaded orderly so as to speed the overall project and ensure precise return of inventory to proper placement. Experience if past experience is a gauge of future quality results, then your organization cannot select a more experienced library moving company than Arnoff Moving, Storage & Rigging. 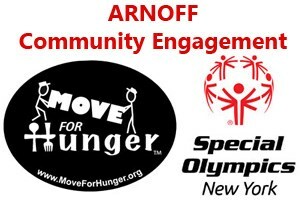 With recent successful experience in moving the largest legal library resource in New York State; the largest privately held collection of historic cultural philosophy in the Upstate; and the largest scientific astronomical collection in the Upstate, Arnoff Moving, Storage & Rigging is the most experienced company serving this field. We are featured in the following video showcasing the relocation of the Rudolf Steiner Library from the Carriage House in Harlemville, NY.